Amazingly delicious and juicy raspberry is among the most popular berries grown all over the world. Raspberry is found in various varieties but the most common type of raspberry (Rubus idaeus) is red-pink in color, hybrids actually come in a range of colors, including black, purple, orange, yellow and white. Raspberry has a conical shape, weighs about 3-4 g and contains 80-100 drupelets arranged in circular layers. Besides their delicious taste they are loaded with several nutritional benefits which makes it an excellent fruit for overall health. Raspberry is a low-glycemic fruit that has a minimal impact on blood glucose which is good for diabetics. Raspberries are a rich source of essential vitamins, fiber and contain phyto-chemical compounds which serve as an antioxidant, not only prevent from skin damaging free radicals but also prevents from early signs of aging. 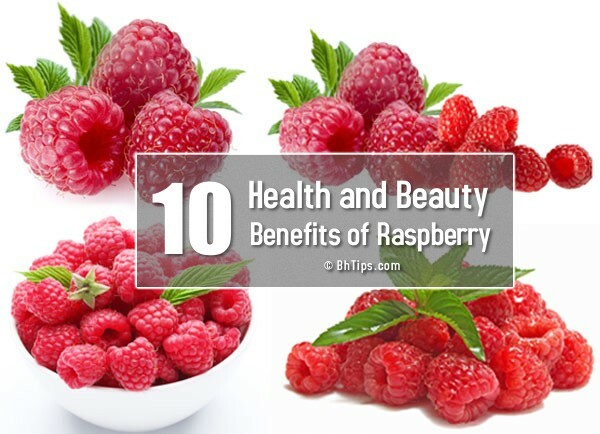 Let's have a look on best health and beauty benefits of raspberry. Anti-oxidants contents in raspberries protect eyes from macular degeneration. Raspberries also contain a good amount of lutein that helps a lot to improve vision. Minerals such as Vitamin C are thought to help the body to develop strong connective tissues and an immune system able to fight against the attack of microorganisms. Raspberries contain about 10 times more antioxidants than tomatoes. The high levels of antioxidants in raspberries make it a great cancer fighting fruit, as antioxidants help protect cells from the damage caused by unstable molecules known as free radicals. Raspberries also contain ellagic acid that is said to be an anti-carcinogenic compound. The potassium content in the berries help maintain the heart beat and blood pressure. The insoluble fiber helps keep the body regular and the soluble fiber is known to lower blood cholesterol and keep heart healthy. Raspberries contain a good amount of iron and copper both of them are essential for production of red blood cells and helps reduce the risk of anemia. Raspberry prevents damage to the cell membranes and other components, reducing fungal and bacterial growth in the body. It also reduces allergic reactions due to anti histamic action. They reduce fever, diarrhoea, relieve bladder and prevent urinary tract infection. According to a recent scientific research eating raspberries can even help enhance fertility in both men and women. The high levels of Vitamin C and magnesium are very much essential for male and female fertility. The antioxidants help protect sperm, promote conception and reduce the risk of miscarriage. Rheosmin is the raspberry ketone that is found in raspberries. The benefit of raspberry ketone is that it increases metabolism in our fat cells by increasing enzyme activity, oxygen consumption and heat production in certain types of fat cells. By boosting fat metabolism, there are less chances of fats to deposit in our cells. This leads to using up to stored fats and reduce obesity. Raspberries is rich in soluble fiber that provides a sense of fullness which prevents from over eating. The carbohydrates in this fruit are released slowly. This prevents sudden increase and decrease in blood sugar levels which helps to control hunger and cravings. They are low in calories and are rich in soluble fiber which keeps the stomach full and reduces regular hunger. The antioxidants in raspberries slow the aging process by neutralising free radicals in the body. Anthocyanins, the flavonoids that give red raspberries their colour, can also help your skin glow. They also stimulate collagen production thus giving you a beautiful complexion and reduce the appearance of age related wrinkles and fine lines.